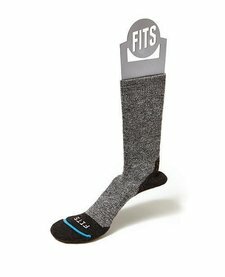 FITS ® is a premium sock brand resulting from the collaboration of third and fourth generation textile manufacturers to create the absolute best fitting sock in the marketplace as a response to an industry-wide epidemic of ill-fitting socks. Utilizing only the best raw materials available, FITS ® incorporates innovative, proprietary engineering and technology to create the most comfortable, best-fitting sock in the world. The result: a product line that embodies the crucial connection between fit and performance.